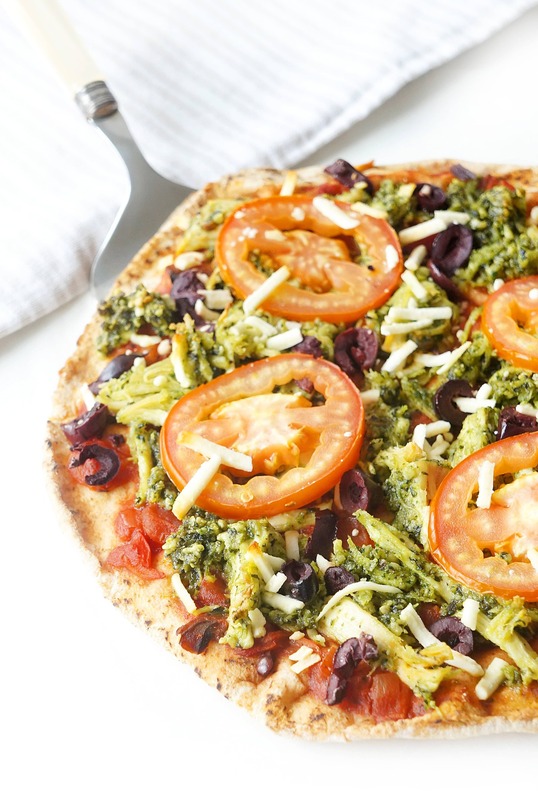 This pesto chicken pizza is a lightened up version of your typical pizza but even more filling due to the extra protein and fibre. 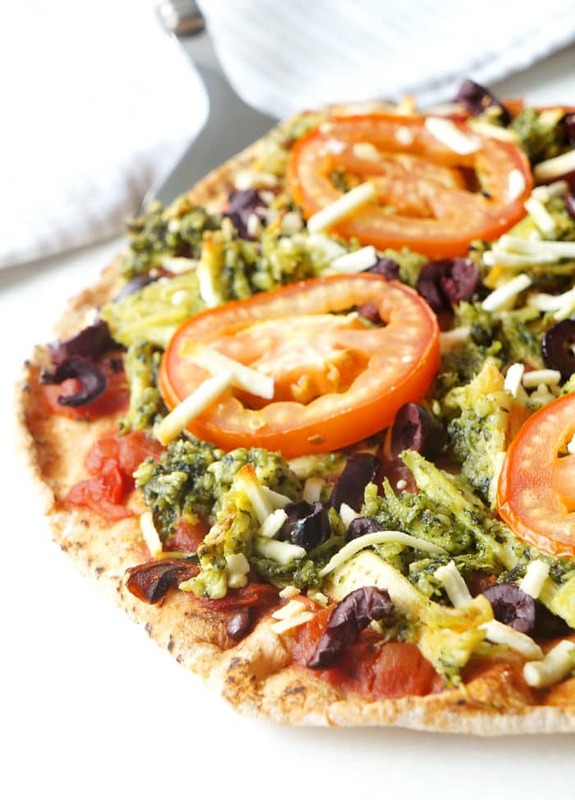 There is so much flavour packed into this pizza, you won’t even miss the additional cheese. It makes the perfect quick, easy and healthy dinner for any weeknight, especially if you prepare the pesto chicken in advance! So let’s talk a little bit about pizza and time saving strategies. Two of my favourite topics these days with an active four month old and minimal time to prep dinner. A few weeks ago I posted this cashew pesto chicken and promised a couple of follow-up recipes for some inspiration as to how I actually use this delicious chicken. My new favourite time saving strategy is to whip up a double batch of this pesto chicken at the beginning of the week. It only takes about 15 minutes of prep time (not including cooking the chicken, which consists of letting the chicken breasts boil in a pot…very hands off) and you get two meals out of it. My favourite type of dinner! Once I’ve prepped the shredded pesto chicken, I’ll put it in the fridge…pretty simple so far right? 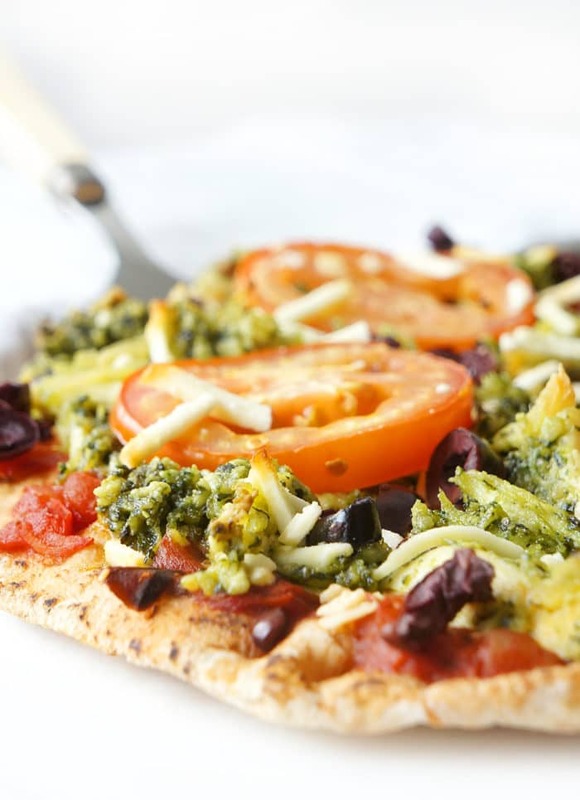 For dinner one night of the week, I’ll use half the chicken to make these pesto chicken pizzas. Basically it’s just assembly. You really don’t even have to measure out the ingredients, but I did to provide some rough quantities for the sake of portion control and the nutrition analysis. Two things we Dietitians like to focus on ;) Don’t want to get too carried away loading up these pizzas! Believe me, it’s not hard to do. So back to pizza building. on a whole wheat pita. Place some pesto chicken on top. Evenly distribute some tomato slices, a tablespoon of sliced olives and crumbled feta over top of the chicken and pop it in the oven to bake for 20 minutes or so. Suddenly pretty much out of nowhere you have this amazingly delicious pizza with a thin crispy crust that also happens to be waist-friendly. Now don’t get me wrong, I love a good pizza, but often times I find the pizzas you buy at a restaurant or store lack protein and fibre. They’re often loaded up with a ton of cheese on a refined white crust, but there’s very little extra nutrients or substance, which usually means I’m hungry not too long after. 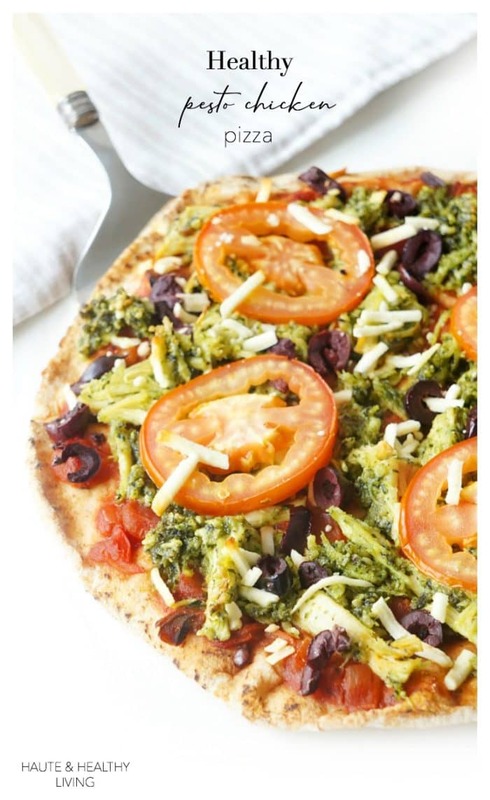 With this pizza however, I love how the chicken adds some additional protein and the tomatoes and whole wheat crust incorporate more fibre. 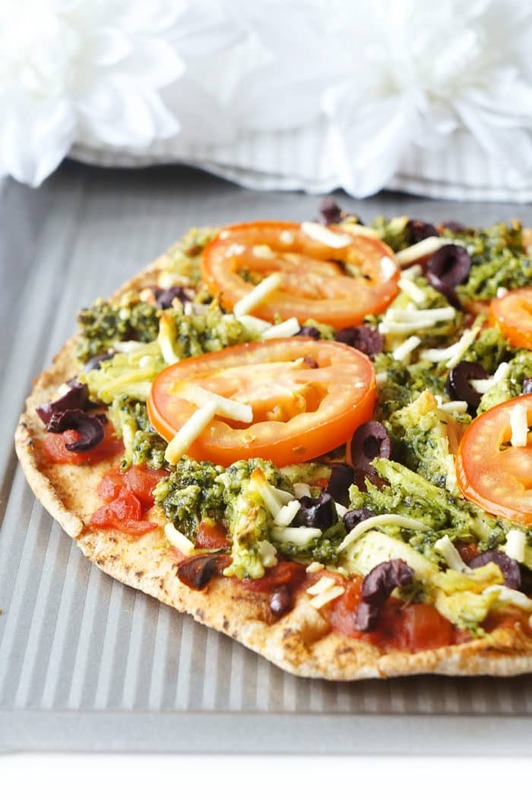 For half a pizza, there’s 15 grams of protein and 3 grams of fibre! The two of these components combined equals one filling and flavourful pizza. Pair it with a yummy salad and you’ve got a healthy and satisfying meal! In fact, it’s one of my favourite meals that I’ve been incorporating lately while also trying to whip myself back into shape post baby (you can check out some of my other post-pregnancy weight loss strategies here). So you might be wondering, what do I do with the other half of the pesto chicken that’s sitting in the fridge? 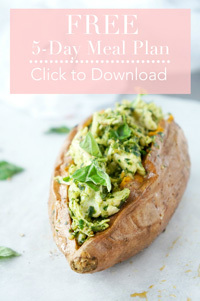 Well the options are endless, but I love doing pesto chicken baked sweet potatoes. Another super easy, healthy and tasty recipe which I’ll be posting shortly. But until then, enjoy this yummy pizza! Arrange 6 pitas on a baking sheet (you might need a few baking sheets to fit all of the pitas). Spread tomato sauce evenly over each pita. Next, top each pita with about half a cup of the pesto chicken (or ⅙th of the recipe per pita). Spread the slices of tomatoes, olives and crumbled feta cheese on top of the chicken on each pizza and place in the oven. Bake for 20 minutes or until the pita becomes crispy. Serve warm. Thank you Abbey! 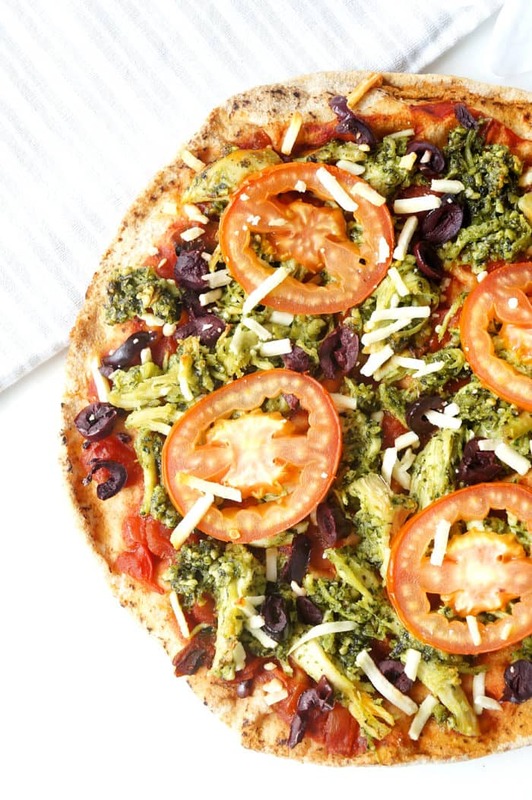 I agree — pesto and pizza = best combo ever! Pesto is my favorite! :D This pizza looks so good! Thanks so much Farrah! I adore pesto too! Thank you Deborah — it’s quite tasty! Pesto is one of my favorites! I bet this is tasty! EVERY SLICE LOOKS LIKE AN INSANE FLAVOR BOMB!!!! Thank you! It’s definitely packed full of flavour! Its look yummy and tasty. I love pizza and chicken both. Now i wanna taste it. thanks for sharing this recipe. Thanks so much Kristen! It’s really delicious and so easy to make! Thanks Kristen! Hope you enjoy the recipe if you have a chance to try it out!